Summon: Battle an enemy creature. Ashlander Zealot is a common Strength creature card. It is part of the Houses of Morrowind expansion. In addition to the card's availability in the Houses of Morrowind expansion, three copies are included in the Redoran Onslaught theme deck. "Death to the Tribunal's lackeys." 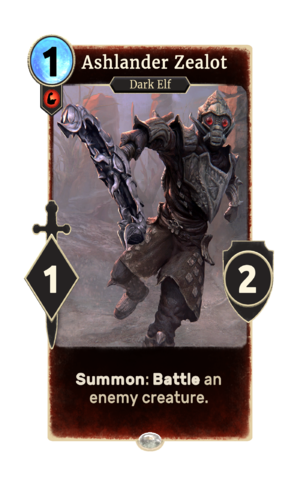 The card is named for the Ashlanders of Morrowind, and the card's audio alludes to the Ashlander-Tribunal Temple schism. The 'Veloth' mentioned in the card's attack audio was a Dark Elf saint who led the Chimer people to the land of Resdayn. The ashlander depicted in the card's art is clad in the garb of a Vvardenfell ashlander as it appeared in ESO. This page was last modified on 2 March 2019, at 00:04.